As parents, it is hard to actually relax on vacation (you all know what I’m talking about). Most of the time my family checks into a hotel, then unpacks our bags and immediately gets back in the car to go explore the area or an attraction. Then we are back in the car to find a restaurant for lunch. And back in the car again to go back to the hotel. There are only a few places I have found where there is enough to do for our whole family that we can park the car and stay in one location. 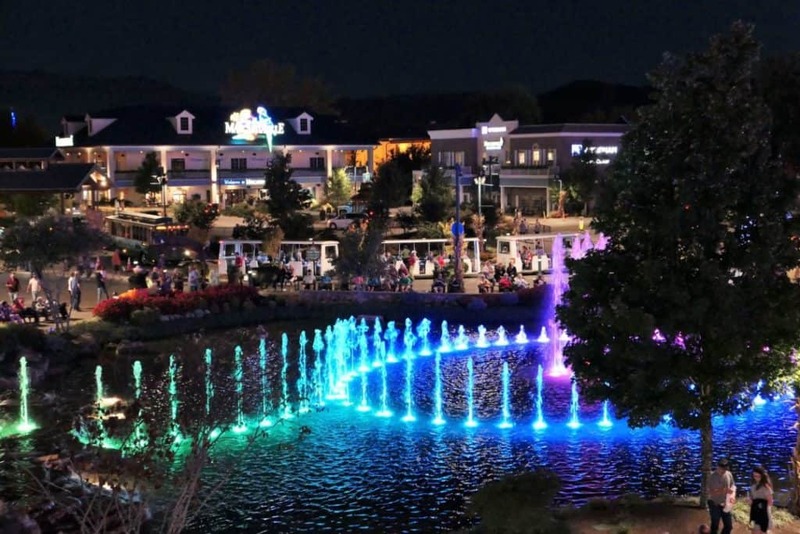 Margaritaville Island Hotel and the Island in Pigeon Forge kept our family busy for more than two days – without leaving! 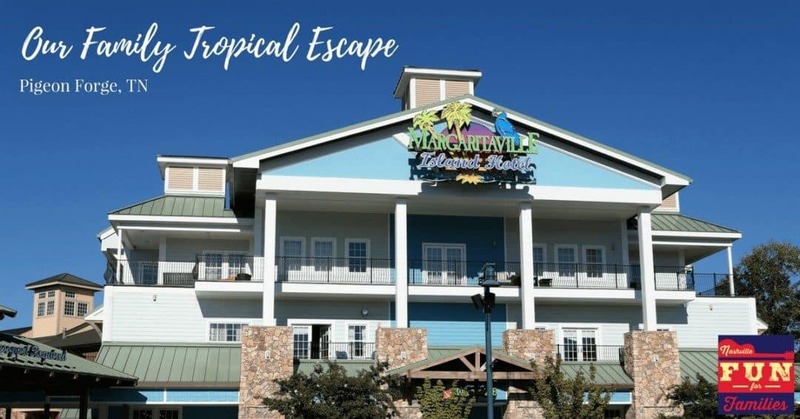 The Margaritaville Island Hotel is located in Pigeon Forge, TN just off Parkway, the main road through town where you can find most of the area attractions. While you are in right in the middle of all the action, the hotel manages to feel secluded for those that want the peace of the mountains. All the rooms have balconies and half of the rooms overlook the Little Pigeon River giving you a tranquil location to relax and read a book. 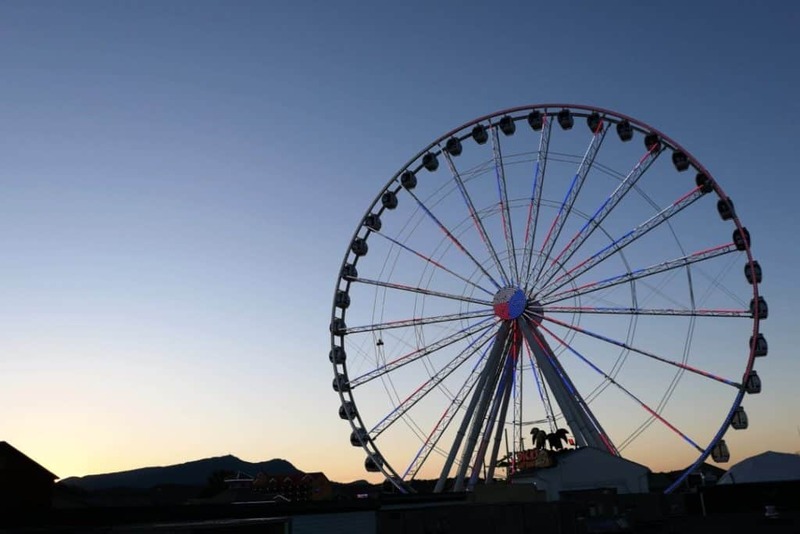 The remaining rooms overlook the Island with views of the shopping area, the Great Smoky Mountain Wheel and the dancing fountains. Although you are in the mountains, the hotel rooms will transport you to the Islands. As I mentioned, each room has a private balcony. There is also a wet bar with a refrigerator and microwave. Start your morning with a cup of coffee from the Keurig coffee maker in your room, and finish your evening with a frozen drink made in your Margaritaville Frozen Concoction Maker. Every room has a gas fireplace that is active October through March. You can control the flame with a remote so you don’t have to get out of bed to adjust the light or temperature. which is controlled with a remote. Wireless internet is complimentary and there are also dual rain shower fixtures in every bathroom. My family spent more than half a day lounging at the rooftop pool. There are plenty of lounge chairs and tables to spend an afternoon or evening. The pool bar has a full drink menu as well as appetizers and sandwiches. Rent a cabana and the bartender will bring drinks and food to you. 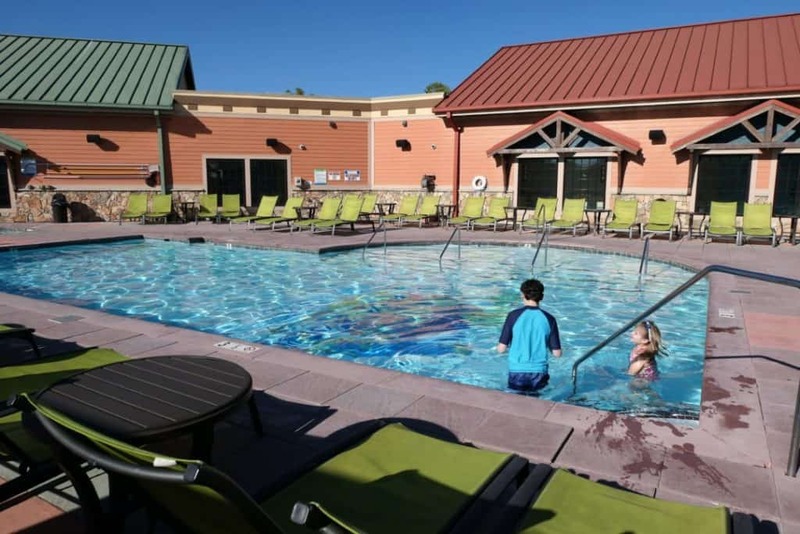 The pool has a wading deck that is perfect for smaller kids to splash and enjoy the water. Two thirds of the pool is 3 to 3.5 feet deep and the remainder is 5 feet. I was able to lounge with a drink and watch my kids swim. There were several other families doing the same and the kids had a blast playing Marco Polo and tossing a beach ball around. We watched the sun go down with the Island Wheel in the background and ordered burgers from the pool bar enjoying the music from the nearby dancing fountains. It was the perfect first night of vacation. Margaritaville’s full service spa is located in the Island shops which is in the middle of the ground floor of the hotel. Treat yourself to a relaxing facial or massage in one of the six treatment rooms. Be sure to arrive at least 15 minutes early for your appointment to have time to fill out forms to give your masseuse or esthetician your preferences and any allergy or health information. Every service starts with a relaxing foot bath allowing you to soak in the calmness of the treatment room before your spa service begins. You can also spend time before and after your spa service in the chill room. It is a quiet space with comfortable loungers and a water wall which adds to the ambiance. Light snacks and water are provided and you can enjoy a chilled glass of complimentary wine after your facial or massage. My daughter and I indulged in Mommy and daughter pedicures. If you have an older child, you could do a spa day. Children need to be over the age of 13 for a facial and over the age of 16 for a massage (a parent must be in the room if a child is under the age of 18). There are four dining options within the hotel and a dozen more choices a short walk away in the Island. Grab drinks or a light meal at one of the hotel’s two bars. Changes in Latitude is located to the right of the lobby and has tables and large sofas to enjoy the ambiance. 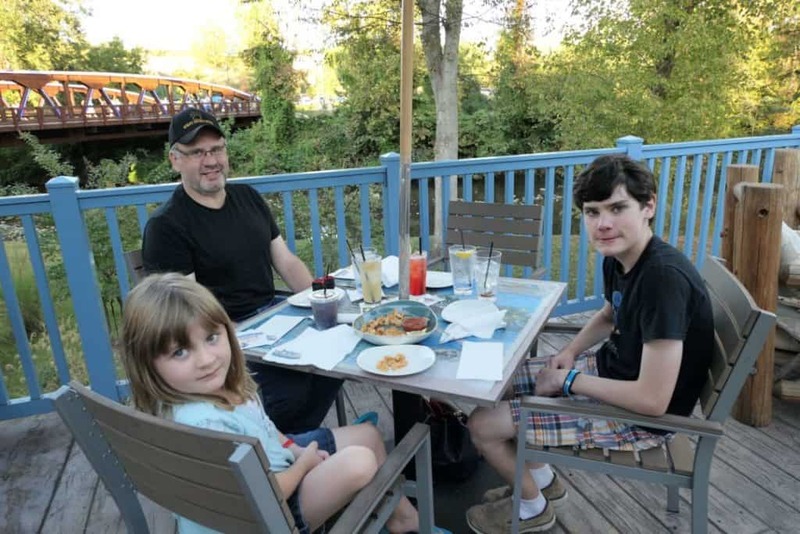 There is also a large patio that overlooks the Little Pigeon River, which is a great spot to enjoy a drink or appetizer and watch the sun set. The Chill Bar is located at the pool. 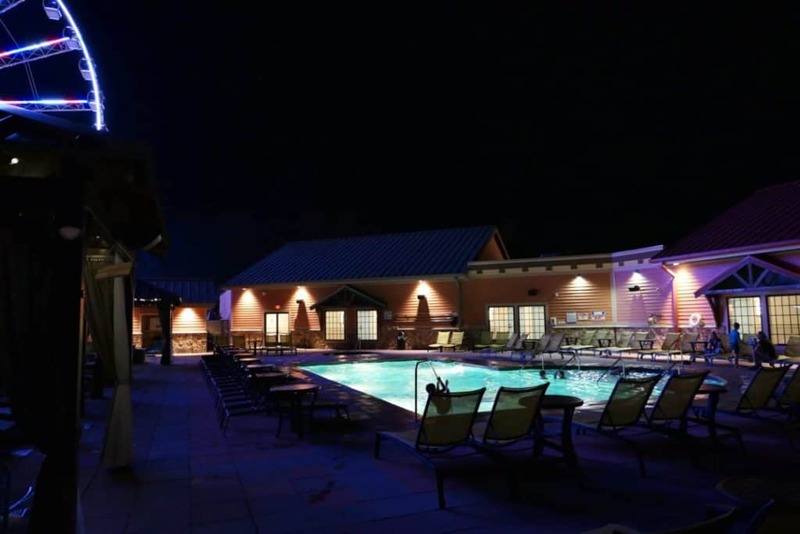 You can get drinks while you swim or enjoy the large patio that overlooks the dancing fountains. Both bars offer mixed and frozen drinks, beer, wine and soft drinks. The menu includes appetizers such as chips and queso plus burgers and sandwiches. There is even a kids menu! Located right across the street from the hotel is Margaritaville’s signature restaurant where you can get a taste of the Islands. There is a large dining room and a beautiful outdoor patio that overlooks the Little Pigeon River. We had dinner on the patio and started with calamari, which was fresh and hand breaded in the restaurant. The menu has lots of options including seafood, chicken, and BBQ Ribs. The kids menu has six choices for kids 12 and under and includes a drink. We indulged in the fish and chips, shrimp and grits and the cheeseburger. There are multiple dessert options, but the Key Lime Pie is Margaritaville’s signature choice. We started both mornings of our stay at Margaritaville Coffee Shop, located right off the hotel’s lobby. There is a large selection of coffee drinks as well as milk and juice for the kids. The first morning we shared an assortment of bagels and coffee cakes. The second morning we indulged in fresh Cinnabons that the staff heated for us. 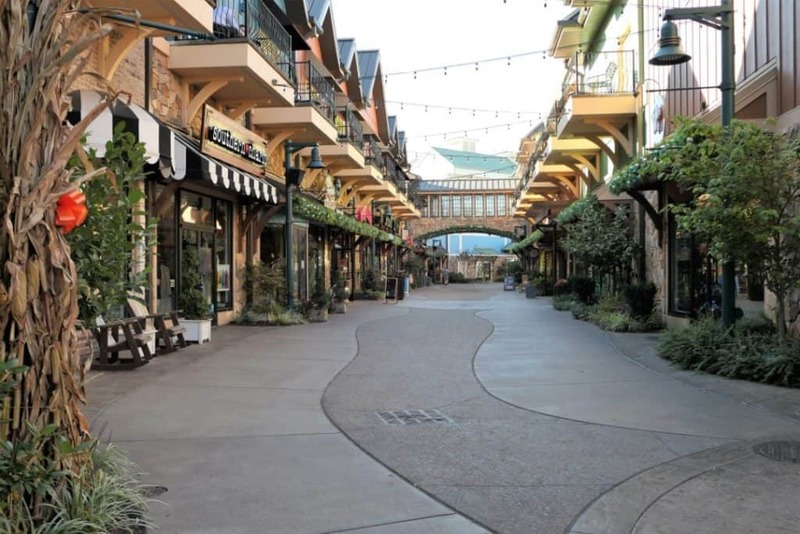 Walk out of the hotel and you can explore the Island in Pigeon Forge. With more than thirty shops, a dozen eateries, plus rides, games and attractions you can easily find enough entertainment for an entire weekend like we did. There is so much to do that the Island deserves it’s own article, which is coming soon! Our family had a wonderful escape on our visit to Margaritaville and we will definitely go back. We discovered we don’t have to choose between the beach and the mountains anymore. At Margaritaville Island Hotel, we can have both! Plan a weekend visit and stay at our new favorite place in the Smokies. Thank you to Margaritaville Island Hotel for sponsoring our experience in Pigeon Forge. Their financial partnership keeps our site FREE for our readers. All opinions are my own.